Nine days to celebrate the win of Lord Sriram over Ravana, nine days to worship Ma Durga, Saraswati and Laxmi and nine days of reverence, prayer, get- together and fun. Navratri culminating in Dussera is a major festival time for all Hindus across India. 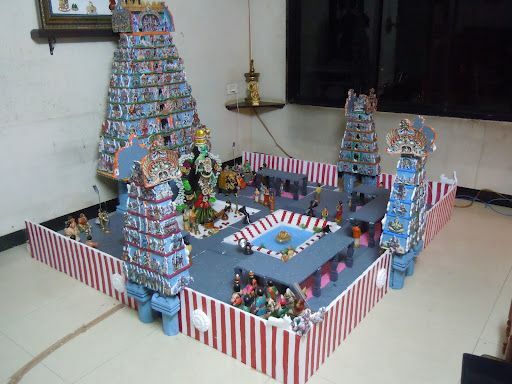 In South India, there is a custom of displaying various idols and dolls on steps which are called Golu Padi. 'Padi' meaning steps.These steps can be either be 9,7,5 or 3. Generally these idols are passed from one generation to another.After the festival is over,the idols are well packed and stored away till the next year.Also, when a family starts the tradition,there might not be many dolls in the collection (though the scenario has changed considerably and people buy the whole set in one go from the market), so the existing dolls are displayed and a new one is added each year. There are many variations now.Customs have been made flexible to accomodate for the changing lifestyle of people. Now, coming to the Golu aspect,elders and youngsters join together and decide on themes to add more appeal to the Golu decoration A little bit of enjoyment, while doing the serious stuff, doesn't do any harm you see! I have put together certain eye catchy and attractive themes for you to follow.Have a look and enjoy the festival time. A very happy Navratri to all and more power to all the women gang out there! Mythological characters are made alive in this themes.The characters can be Ram Lakshman and Sita during their stay in a jungle .Ravana can also be dispalyed in the Golu padi along with them.Here the eternal theme of 'Good wins over evil' is conveyed. 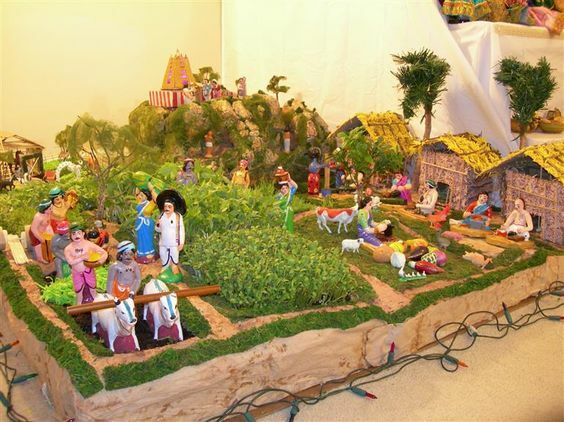 Again, Dashavatara or the ten incarnations of Lord Mahavishnu is also a very popular theme. Durga kills the asur Mahishasur and is the universal theme in all the pandals in the East. 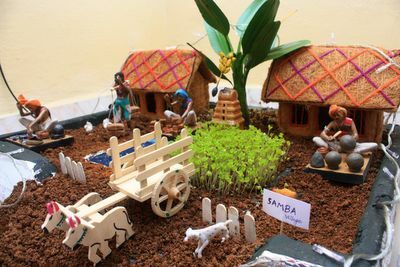 Use real mud in a tray and place the farmers and bullock cart, some faux trees, Popsicle stick for the fence etc and your farm is ready. These themes can be made in addition to the main dolls and idols. A little creativity ,out of the box thinking and loads of patience is required to make these attractive arrangements. 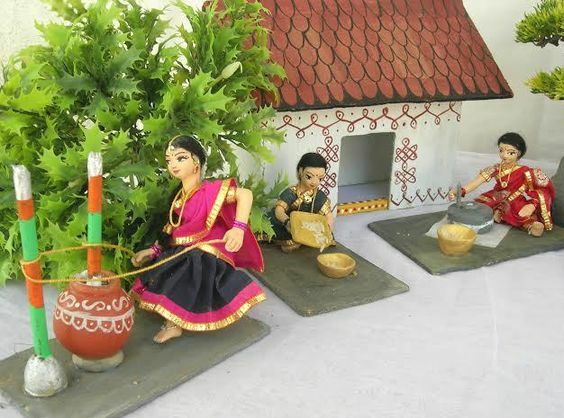 The chettiar and his wife form an essential part of the golu decoration .The chettiars are the merchant community and the Golu decoration always revolved around featuring the various communities in the society. This year am seeing a lot of Chotta bheem' bommais' or dolls in the market.Maybe to keep the spirits of the kids high.Similarly fairy tale themes for the girls can also be managed. Themes featuring social messages have also become the norm of the day. Like in Bangalore saving the lakes and the traffic woes are relevant topics that one might chose to display. 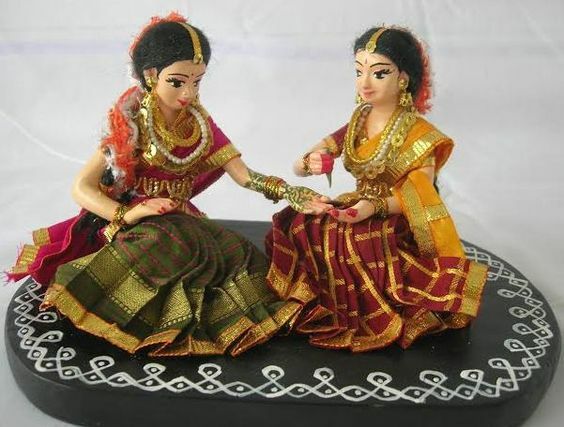 Months in advance the preparations for Golu begins.If you have the relevant dolls ,they can be assembled and a theme can be laid out in no time but for certain elaborate concepts, there is lot of effort and time to be put in. 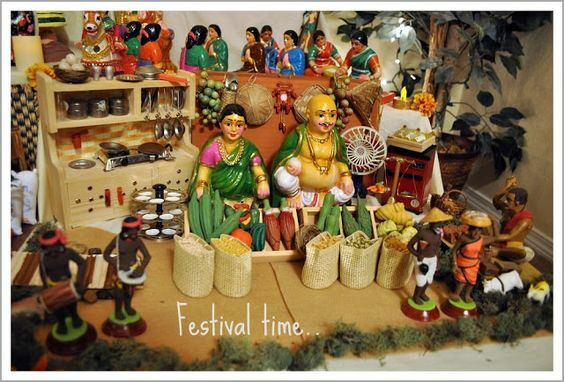 Golu, I have always felt is a celebration to bring the family together. Enjoying the little DIY's that one can work upon as a whole unit, making yummy and Delicious sweets and savories and having a gala time in each other's company is the essence of any festival. 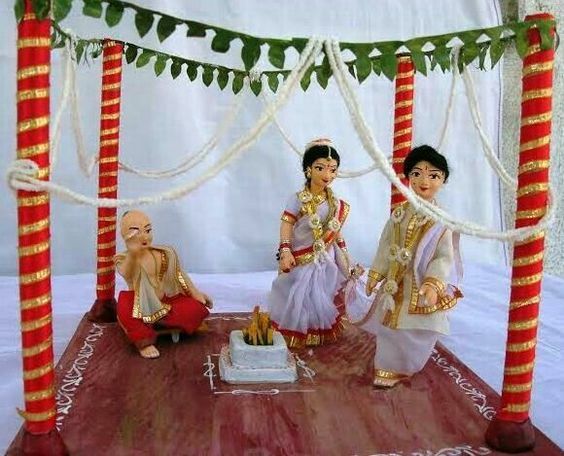 You can also have a look at the earlier published posts on Sajavat on Navratri and Golu here. 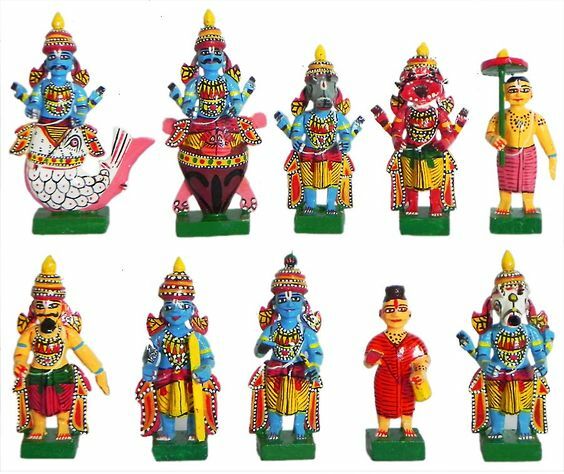 Loved this golu collection ,made me miss my childhood more looking at all the toys that have come into the recent markets. Loved the Amman & Chettiar dolls from yesteryears....keep sharing, it brings a warm feeling for those of us who are far away from the motherland. i like all the dolls displayed here. where can u buy them ? 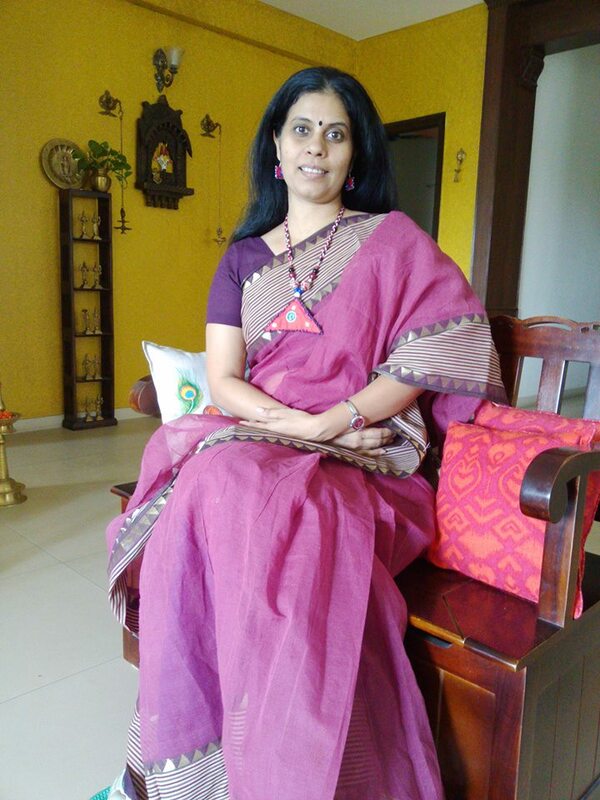 Thank you so much dear readers.Really appreciate your stopping by to comment.Glad you liked the post! Have these themes changed over the time? Yes Meghana, It's heartwarming to see and be able to participate in such a variety of traditions across our country.The basics of the Golu display is still very much the same but a s mentioned in the post many socially relevant themes are being displayed now a days to highlight the issue and push the younger generation to take up the causes and find solutions to them, in their own capacity.A sign of changing times you see! 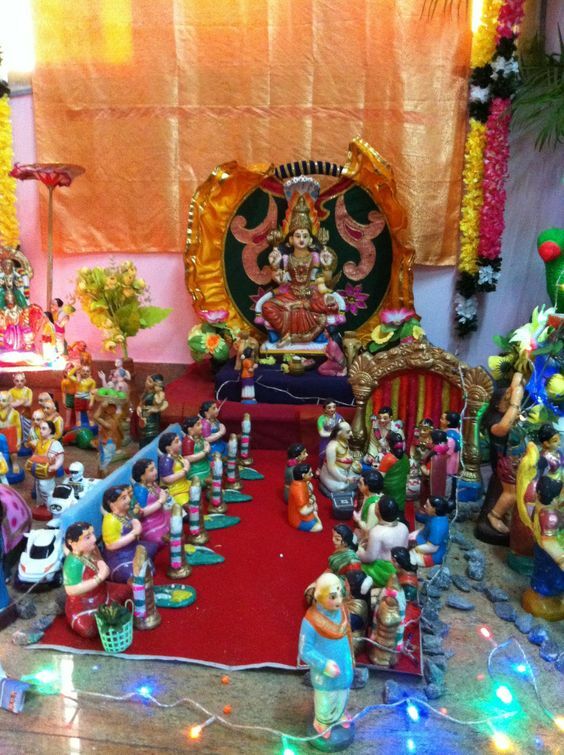 Nice Golu decoration, this year i used Artificial flowers and plants for my golu decoration. Fourwalls.in has huge collection of artificial flowers and plants. Do check them out.